The digital music revolution has very nearly delivered that long-coveted celestial jukebox, with all the music you would ever want at your fingertips. The problem is, it could be trapped in your computer or smartphone. For many of us, ever-expanding digital music collections are ensnared in our devices — liberated only by headphones, small speaker docks and portable speakers like the Jambox. Those work fine for many situations. But they can't fill an entire house with sound. Thankfully, there's a growing selection of wireless audio systems that get music from room to room. "There is a need in the home for distributed music," says Oliver Bergmann of Olive, maker of home music servers that connect like stereo components. The company has taken to crowd-funding site Indiegogo for consumer support of a new customizable home music hub called the Olive One. "We are fighting for that and better music in the home," Bergmann says. Those are causes that should resonate with music devotees. For many older listeners, the decline of vinyl and compact discs resulted in cherished home sound systems getting dusty while iPods and other music players stole the attention. Other younger, more mobile music consumers have settled down in apartments or homes and found their small speakers not worthy of being cranked up to 11. 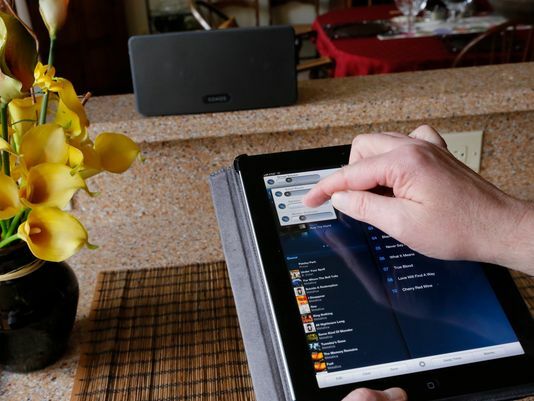 Consumer interest in higher-tech home music systems is on the rise, as are innovations in wireless technology and higher-resolution digital music files. "There's a convergence of technology that makes this a specific category that will definitely accelerate," says Tom Kerber, director of research, home controls and energy at Parks Associates. Digital music sales surpassed physical sales of CDs in 2011. At the same time, sales of home audio components are expected to rise slightly, from about $1.3 billion in 2011 to $1.5 billion in 2015, the Consumer Electronics Association estimates. Among the hot products are wireless speakers, which rose 175% from 2011 to 2012, amounting to sales of about $383 million, according to The NPD Group. "Mobile is really fueling a lot of that growth," says NPD analyst Ben Arnold. The need to spread the reach of digital music libraries to multiple rooms in the home "is something that is still building." The old-fashioned way to get music circulating in the home — installation — is still popular. About 27% of residential remodeling projects included a multiroom audio system, according to a recent Consumer Electronics Association builders survey. In most cases, however, "You can't ask people to run wires through their walls. Maybe on a rare occasion once in their life they are building a house or remodeling one," says John MacFarlane, CEO of Sonos, which makes wireless music systems that can be expanded throughout the house. Sales are on the rise for the Santa Barbara, Calif.-based company, founded in 2002. More than 2 million rooms have been outfitted with a Sonos system. It took the company five years to sell its first million players, but it has sold more than a million more in 2012 and the first part of 2013. Retrospectively, the home music digital dilemma should have been easy to foresee. "If you took a step back, there were more people listening to music than ever before," MacFarlane says. But digital music and home playback "were not connected in the home anymore," he says. "That's what got us passionate for this area." Sonos' line of products includes two sizes of amplified speakers — the $399 Play:5 and the smaller $299 Play:3 , which can be linked wirelessly in your home. (A $49 Bridge product connects to your router.) A free app on your Apple iOS or Android smartphone or tablet gives you control of your music library and music services such as MOG, Pandora and Spotify. It also controls volume and distribution of sound. The company recently added a TV sound bar speaker, the $699 Playbar, into the mix. It doubles as a top-notch TV speaker –— it has three tweeters and six mid-woofers built-in — that connects to your wireless sound system. A $699 subwoofer adds extra bass and effects for movie lovers. For now, Sonos has the best multiroom option available, but other companies are aiming at the market. Electronics company Monster has a $99 StreamCast module that plugs into its Clarity HD speakers ($749.95 for a pair) and the Beats By Dr. Dre Beatbox ($399.95) to let you listen to music from your smartphone, tablet or laptop via a higher-resolution form of Bluetooth. This summer, Monster will bring out its $699.95 Katana speakers, which have built-in Bluetooth but can also be connected throughout the home using StreamCast HD wireless modules. With one in your laptop and one in each Katana, you can send up to four different streams to 12 different zones of the home. Also in the works and expected to be shipping in July is the Olive One all-in-one home music player ($399). The company just ended its crowd-funding phase. The circular touch-screen unit connects wirelessly and via Bluetooth to send music on computers and devices (Android, Apple and Windows Phone 8) throughout the home; you put an Olive in whatever room you want sound. It will also send YouTube video to a TV while audio flows to your wired or wireless speakers. Already loaded with Pandora, the Olive One is a virtual music computer that will also stream music from other Internet music services and your cloud-stored music from Amazon, iTunes and Google Play. Buyers can add 1 terabyte or 2TB hard drives to store on board. Olive has its own speakers in development, due by year's end at $199 each, that match the look of the One and can be stacked or paired for different sound configurations, depending on the size of your room. "People thought it was great when the MP3 came out and we could have all this music crammed onto portable hard drives," Bergmann says. "But as we've gotten used to it, we realized that the music quality is not as good as we would like. Meanwhile, we also want to move that around our home and have some flexibility." Those more interested in the ability to move a speaker from room to room could investigate the Bose SoundLink Air digital music system ($349.95). The 6.75-inch speaker plays music from your Apple devices or iTunes collection on a Mac or Windows computer; multiple speakers can play back computer-streamed music simultaneously. It uses Apple's wireless AirPlay technology, which also improves the sound of music over standard Bluetooth. McIntosh's McAire integrated audio systems ($3,000), which also uses AirPlay, has six built-in speakers and is plenty powerful to serenade an apartment or small home. The retro-looking unit from longtime high-end audio maker McIntosh connects to your wireless network so you can stream iTunes music from computers, iPads, iPhones and iPods. A USB connector lets you charge and play an iPod or iPhone, and an Auxiliary input lets you link in other devices such as a CD player or portable satellite radio. You could also connect the system to your TV to let it deliver audio should your flat-panel display's sound disappoint. The McAire can "get a lot more out of the music file," says Charlie Randall, president of Binghamton, N.Y.-based McIntosh. "There's been a decade of portable convenient digital audio. Now people are taking a step back and want to hear more of the music." The advent of iPods and tablets could have spelled doom for traditional audio companies. "But no matter what the medium is that you get the sound from, as long as we can make it sound better, (consumers) are going to aspire to it," Randall says, "whether they drop a CD in the drawer, tune a radio station, put a piece of vinyl on or grab (music) off the cloud." • Expandability. How many rooms do want to fill and how loud do you want it? If you have a large home, the Sonos and Bose systems can be expanded by putting speakers in multiple rooms (that's also part of Monster and Olive's upcoming plans). • Operating system. Make sure you match your purchase with the music library you have accumulated. If you are an iTunes-only user, it's easier because all the systems are Apple-friendly. But if your music is on a BlackBerry, for instance, you may want to look at individual Bluetooth-based speakers from makers such as Bose and Beats. • Format choice. All the systems will handle your MP3, but if you save music in higher resolution formats such as Apple Lossless and FLAC (Free Lossless Audio Codec), you might want to stick to the Sonos system which supports such formats. • Crowd size. If you have multiple listeners who want to make their own musical selections in one room while someone else is listening to something else in another room, that's something the Sonos currently provides. Each member of the family can control what's playing on their own device. The systems from Monster and Olive plan similar features. • Sound quality. Try to listen before you buy. Everyone's ears are different. Some people may not hear much of a difference between these higher-tech systems and individual Bluetooth speakers. Sonos and Bose players can be found in thousands of retailers; so can Monster's speakers and McIntosh is in 200 or more. And Bose has more than 130 of its own stores.